Carry case/bag for Rigol DS2000 scope? I bought a DS2072 a few years back from tequipment.net. At the time, I remember their having a bag available that would fit it well, and I recall (perhaps incorrectly) the price being around $30. At the time, I didn't see a need for the bag, so I didn't buy it. Now, of course, I see a need, or at least a want, for a bag. So back to tequipment.net I go, and I see that Rigol makes a bag for this scope--for $150. May be a nice bag, may even be a good value, but way more than I'm wanting to spend--that's perilously close to a Pelican case. I emailed them to ask about other options, and they responded with a quote for another bag from IWH, and it sounds like the quote is discounted a bit, but $115 is still more than I'm wanting to pay. All I'm looking for is a soft-side bag, and it'd be nice if it had pockets for the probes, power cord, etc. Any suggestions on a reasonably-priced alternative? Re: Carry case/bag for Rigol DS2000 scope? I wasn't really thinking about going DIY for the case, but I guess that's an option... When I mentioned the Pelican case, their model 1460 seems to be a suitable size, and it's about $120 on Amazon, so that really makes the soft-side bags look a bit overpriced IMO. I use a Pelican style case for mine. I think it's a replica of the 1460. The downside is that it is *HEAVY*, it easily doubles the weight of the scope and doesn't fit that many extra accessories. It's a tradeoff, like most things. I very much wish I had one of the soft cases for local storage and transport. The hard case came in handy when it was shipped UK to Germany for service. Well if you promise you won't buy all of them out and save me two of them, will this work for $19.97? The official Rigol case for the 2000 does seem a bit pricey. But I did get their proper case for my 1054Z and it is a lot more than just a fancy gym bag with padding. I imagine that the 2000 case is similar. No, I'm not a Rigol salesman! I just like well-designed carrying cases for stuff. What about the Rigol bag available from Saelig? Is this the official Rigol bag? It seems to be much less costly here. @pascal_sweden, that's the case for the DS1000Z series. Same price as on tequipment.net. @BillW50, looks quite attractive, but says it fits the 1000 and 1000Z series, which would likely be a bit too small for a DS2000-series. They also sell a "large padded equipment bag" (http://www.saelig.com/PSBEAO/M00074001.htm) for $29.97 which might be an option. As a matter of fact, Saelig lists that bag as a (free) option with a DS2000A scope. Thanks for the pointer there; I may need to look around a bit. That's the official bag for the DS1000 series, as shown in my video. It will not fit the DS2000. Is the DS2000A series that much bigger than the DS1000Z series? Who has both units at home, and can make a picture from the DS1000Z on top of the DS2000A to see the relative difference in size? These Saelig bags look pretty neat! I have an MSO1104Z and I used a Monoprice 12138 hard case FWIW. It was about $70USD shipped with coupon and has just enough room. The pic isn't great but shows the general size relationship. How did you make the nice openings in the foam for such a good fit? It's not that much bigger but the Rigol 1000 series case fits very precisely, the 2000 won't fit in there. Dave compares the sizes of the 1054 against a 2000 series scope in his video, IIRC. If you're asking me, the type of foam in these cases make this really easy. It's split into hundreds of little "french fry" shape pieces that are loosely connected. So you simply dig out the foam you want gone. What about the carry case for the Siglent SDS1000 series? Maybe that has some margins, and would be a great fit for either the Rigol DS1000Z or the Rigol DS2000A? It's a very interesting price, and the bag looks pretty neat. @pascal_sweden: Same as jrmymllr said. I bought surplus pick and pluck foam and used an exacto knife to cut out the inserts. I can pressure fit the DS2102 into mine and I'd be willing (in theory) to turn it upside down. Not shake it!, but invert it. The two small side depressions are just 1/3 height cuts which make it very easy to pull out. I usually have the power cable and a pair of probes in the side slot, but I've lost the probes during a move! Anyone know a source for a good pair of 250+ MHz probes? send me an email and I can sell this to eevblog people for 50 dollars. This is a new case we had made that fits large scopes. Tried to email you; it wouldn't work (just redirected me to your post). PM sent. tequipment have set up a coupon code for the case mentioned in the thread. They said it was OK to post the code here. Use coupon code "CASE50" to get the case for $50, which is basically their cost. For those that haven't ordered from them before, they are in my experience a first-rate vendor. They stand behind the products, even long after the sale. For example, they helped me get an answer from Rigol when I was having some network-induced lock-up issues with my DS2072. 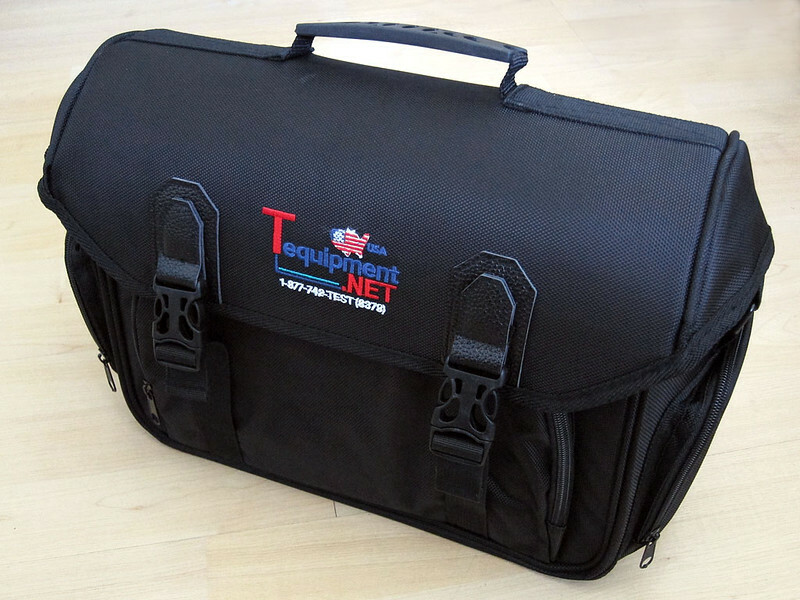 tequipment - what are the internal dimensions of this case? I find this cute little back pack fits the DS1054Z like a glove. Just a tad too small for the DS2000 which is a shame. I got the quote from tequipment and ordered the case; it should be here Friday. Good to know the offer's open to everyone here, at least for a while. I ordered one as well. I'll take some measurements and post them when it gets here.